Why Testing is Critical to Blockchain and Why Should you Choose MagicBlockchainQA.com? Magic's Blockchain Quality Assurance team is battle-tested and brings its diverse experience to test your product suite. Our team has the experience of dealing with real-world Blockchain applications. We enable our clients to focus on their product functionality and markets while we take care of the product quality by leveraging our vast test case repository and automation framework. Smart contract and Blockchain infrastructure are the two most essential components of any Blockchain ecosystem. 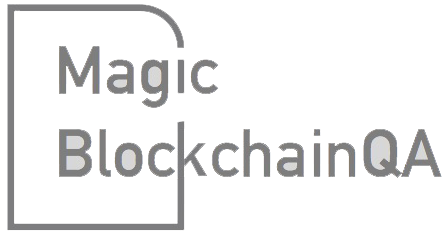 Magic is fully equipped to test both the functionality of the block as well as Blockchain infrastructure to provide you with a hassle-free and independent validation. Our team often provides critical and timely feedback to help product owner drive improvements to product functionality and stability. Magic can scale quickly at short notice to meet your business needs. Our testing team has sound knowledge of the Blockchain infrastructure and can be your extended DevOps and support team if needed. Magic's offshore leverage, coupled with its team's diverse skills, flexibility to work in different time zones, and above-all, real-life experience of the Blockchain ecosystem will deliver a higher return on your investment in no time. QA's integration with the overall development cycle is often the key to ensuring product quality and stability. Magic has a proven engagement model that ensures success for our clients. There are 4 pillars of this engagement model.